The Bar Association of Sri Lanka (BASL), in a statement, condemned Parliamentarian Wimal Weerawansa‘s statement that the Constitutional Council and the appointment of apex court judges are influenced by a US-funded religious sect. The BASL said Weerawansa’s statement impinged on the independence of the Judiciary and the Rule of Law. “Had this speech been made outside Parliament, the Bar Association of Sri Lanka would have without any hesitation called for him to be dealt with for Contempt of Court in terms of the law,” the BASL added. Hon. Weerawansa stated that “the Supreme Court has become a den for a certain religious sect.” In the course of speech Mr. Weerawansa alleged that the Constitutional Council had approved only the names of persons from a certain religious sect for appointments to the Supreme Court. When appointments to the Supreme Court over the last few years are considered it is clear that Weerawansa’s statements are baseless and devoid of truth. The aforesaid words of Weerawansa have effect of interfering with the independence of the Judiciary of this country. The Bar Association of Sri Lanka stresses that the race and religion of members of the Judiciary should not be used to unfairly attack the Judiciary. Whilst members of the public including politicians are entitled to criticise the Judiciary in a reasonable and objective manner, they are not entitled to cast aspersions on the Judiciary in such a manner as to bring the Court into disrepute. Such attacks impinge on the independence of the Judiciary and the Rule of Law. 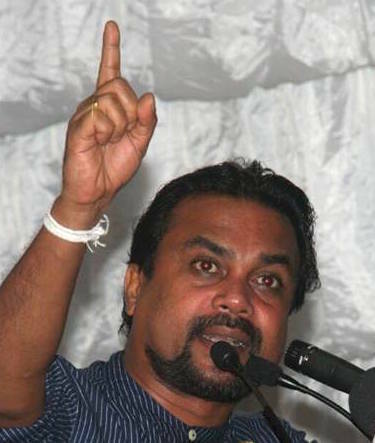 “It is regrettable that Weerawansa has made this speech in Parliament under cover of privilege, preventing him from being dealt with by the laws of contempt. Had this speech been made outside Parliament, the Bar Association of Sri Lanka would have without any hesitation called for him to be dealt with for Contempt of Court in terms of the law”.